Quinultagh, near Dunmore, is derived from Ultach - an Ulsterman. Along the Western and Southern slopes of Sliabh Dart there are many thickly-populated villages. The advent of this population to the locality synchronises with the Plantation of Ulster hundreds of years ago, and these people, who are still decidedly clannish, are the descendants of the expropriated Catholic tenantry of parts of Ulster, who, dispossessed of their farms and homesteads in the Black North, took up their residence on this heather-growing range, which reminded them of their native homes amid the dark mountains of Tyrone and Donegal. They still cherish many traditions of the olden times, when their forefathers had to carry faction fights when, standing together like one man, they always gained the day. The sites of ring forts, dolmen and early Christian churches suggest that people settled in the area in ancient times. The land in general was poor and marshy and large areas were covered with pine forests or bog. Remains of the roots of these large pine trees are evident in the area still. The population greatly increased in the late 1700's and early 1800's with the arrival of many displaced families from other counties. These families proceeded to clear away and drain the land. Many townlands contain the word cluain which means reclaimed meadows. Many families from Ulster settled in Quinaltagh and Shanballymore where they courageously established farms from the stony ground. Evidence of massive stone wall structures can still be widely found in these villages. 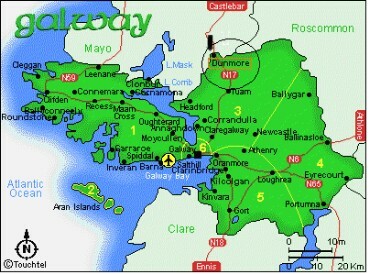 The people of this area suffered greatly during the 1800s and the population was decimated by the Great Famine of 1845. In post famine times a wave of evictions forced many families onto the side of the road. It is said that 13 families were evicted from Cloonfane on one day alone and the population dropped from 365 to 160 in 10 years. Threatened evictions in Quinaltagh sparked the monster meeting in Irishtown where Michael Davitt formally launched the Irish Land League. Emigration became the new scourge of the area right up to the 1960's. Due to lack of employment hundreds of young men and women were left with no option to emigrate to the U.S. and England. We find, says a reverend and learned correspondent, reference is made to Dunmore in the annals of the Four Masters as early as A.D. 1133, when Mac Carthy and Conor O'Brien, of Munster, destroyed it. In A.D. 1155 Murthough O'Loughlin burned the town and raised the walls to the ground. In A.D. 1177 Milo de Cogan occupied Dunmore with 40 men at arms, 200 horse soldiers, and 300 archers. King Rory O'Connor after a successful attack put this army to fight ; and the English did not encamp until they reached the other side of the Shannon at Lanesboro. In A.D. 1558, Captain Mordaunt led an English army from Lanesboro through Roscommon. It is recorded that the English soldiers raised a mutiny against the captain in the town, and to be marched them back again. Hosty was not long in the quiet possession of this Castle when Bermingham came hither from the north, where he was after gaining a great victory, and drove him out of it partly by force and partly by treachery ; and his descendants who assumed the name of Mac-orish, maintained possession of it until the wars of Ireland, when Col. Hoath drove them out. This is all that tradition remembers of this fortress. The Castle stands on a small hill over a rivulet about a quarter mile to the west of the little town of Dunmore. The hill seems to have been originally crowned with an earthen 'Dun', from which the name, but it is now so effaced that no idea can be drawn as to the extent or character. The entire hill was enclosed by a strong wall now almost entirely destroyed, some of it scattered about in massy fragments, and some tumbled in the rivulet. The Castle itself is a square building, measuring on the inside 45 feet in length and 27 in breadth, and, as well as I could judge by the eye, 60 in height. Walls 7 ft. thick. It had three lofts, as appears from the windows erected by Hosty-Mac-Membric. The Four Masters have collected the following Annals of this place, from which it appears that it was an ancient Irish Military station before the arrival of the Anglo-Norman and Welsh families. "1133, Cormac MacCarthy and Conor O'Brien led an army into Connaught and killed Cathal O'Conor Raydamna of Connaught and O'Flynn, chief of Sil-moc-lomain, and the DEMOLISHED Dunmugdorn and DUN-MORE, and plundered a great part of the country." "1143, Morogh O'Melaghlin, King of Meath, was most treacherously taken prisoner by King Turlogh O'Conor, and confined with other Meathian prisoners in DUN-MORE." "1159, Murtagh MacLoughlin (presumptive monarch of Ireland) with the nobles of Kinel-Connell, Kinel-Owen and Oriel, marched an army into Connaught and burned Dun-More, Dun-Ciar and Dun na ngall and devastated a great part of the country." "1249, Dunmore was burned by he sons of the King of Connaught." "1271, Matthew O'Conor was killed by the English of Dunmore." "1284, Dunmore was burned by Fiachra O'Flynn." "1569, Sir Henry Sydney took (the Castle of) Dunmore Mac-Feorais and Roscommon." 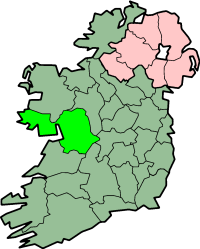 Archdall is wrong in making this the 'Domhnach padraig' of the Tripartite, as we shall show when treating the parish of Donagh-patrick. It is sufficient here to observe that the two names are not identical, and that DUN-more is not a corruption of DOMHNACH-more as Donshaughlin in Meath of Domhnach Seachlainn. *It is possible that it could be a corruption of it,* but, we know from history that it is not. "This Abbey is in the town of Dunmore, and, I believe, was much larger, but cannot be traced as the ground is level and no ruins about, it being a kind of market, the part A. on the plan is a waste, the arches built up, and B. is converted into a parish church where service is performed. Over the door C. are arms and an inscription which I copied. Said to be built by the Lords of "Athenry". 1855 found Thomas as an owner (2 +) of acreage in Kilnalappa, according to Griffiths' Valuation. additional information on Dunmore Knight's. 4. Mary Knight72 years old, buried June 10, 1943. ( Edward's wife, Mary Gannon??) Time frame appears right. been employed there for a number of years. Bridgit Cottle Knight's .Place of birth unknown.Parents also unknown. moved to England, but apparantly went there, to be near sons, Edward and Daniel, after her husband Thomas died. Margaret it is spelled Cottel. Following is list of children born to Bridget.Is son Thomas fictional?? services.It appears that a service was held at Sacred Heart Church in Hindsford. 2.ii.EDWARD KNIGHT, b. July 09, 1866. 3.iii.MARGARET KNIGHT, b. June 22, 1871, Kilnalappa, Dunmore, Galway. Ireland; d. Baltimore, Maryland. Patrick is listed on 1901 Census as being 27 years old, unmarried and living at home with his parents and sisters. Nothing else is known of Patrick. 4.v.DELIA KNIGHT, b. February 02, 1875, Dunmore, Town of Kilnalappa, County Galway, Ireland;d. September 01, 1943, Baltimore, Md., St. Agnes Hospital, Baltimore..
5.vi.DANIEL KNIGHT, b. November 15, 1876, Dunmore , Kilnalappa, Galway Ireland; d. August 20, 1960, Boothstown, Manchester, England. vii.HONORA KNIGHT, b. February 20, 1879.
viii.ELLEN KNIGHT, b. February 02, 1882.
ix.WALTER KNIGHT, b. July 02, 1882. 2.Edward2 Knight (Thomas1) was born July 09, 1866.He married Mary Gannon.She was born 1871 in Tyldsley. born in Ireland.Thomas Gannon was widowed and age 51. The family was living at 7 Chaddack Lane.County Lancashire. arrived in Manchester about 1880.There was a Patrick Knight and Mary Gannon married in Kilnalappa in the 1800's. Could be related to Thomas Gannon. Gannon also worked at Hewer Mines.